Without a doubt my helmet goes anywhere and everywhere. My harness is a very comfy, fully adjustable and has 5 gear loops. I find harnesses that have four gear loops get a little cramped so the fifth ones give the optimum amount, you can get them with more I tend to just forget where I put the gear. I personally use a Wild country guide plate, this is the perfect size for using two ropes both lead belaying and in the guide plate mode. Two prusiks for those hoists, and abseils. Attached to a piece of string and snap gate. These are kept on the back of my harness for the anchor setup when I get to the top. I carry a selection of quickdraws but all with very light karabiners, weight does matter so save it where you can. My selection of quickdraws consists of 15-22cm tapes and extendable quickdraws able to extend my gear if its needed. Excellent for the mountain crags and can often be that little bit of bomber gear you need when times are looking a bit thin. I have two different makes of wires split over three karabiners, a set of DMM and a set of Wild Country nuts. I find these compliment each other nicely. I split them over three karabiners (See picture) so it helps me when I am gripped trying to get the little wire off a krab with over twenty nuts on. It’s also a good idea to overlap the size of nuts as you will always pick the wrong set up and have to keep swapping karabiners. These are expensive bits of kit but well worth having, I usually take four but get what you can, I use the Black Diamond camalots as I think these are the best, I take out size .50, .75, 1 & 2. These cam sneak into places gear doesn’t usually go and can be a very quick lifesaver when you’re needing a little bit of gear fast. 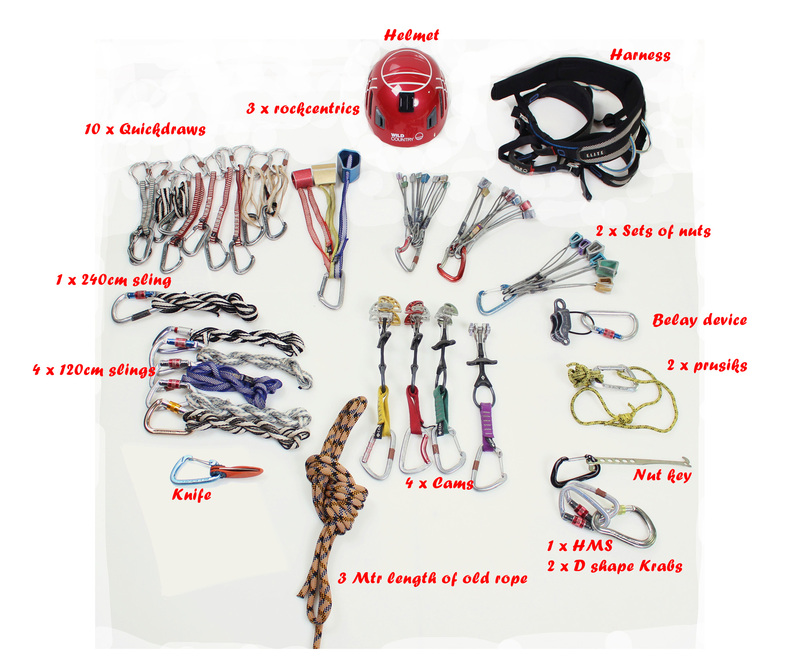 Make sure these all have karabiners on, if I am on a Gritstone crag I may even take out 2 x 240 slings as the gear is big boulders. If for any reason I need to retreat of the crag it’s always worth while leaving behind a little kit not really needed rather than your new sling. This being said it’s not a case of going out to clutter up our crags with old tat! Also for when I find the old tat on crags I tend to cut it down, always check though if it is an obvious abseil spot for a particular route or if it has been left in an emergency. If so cut it off and take it with you, if it’s for an in situ abseil then I make check the condition of the tat and change if with mine if needed.